Last year one of my photographs was displayed in an exhibition organised by the Geography Department at Durham University. 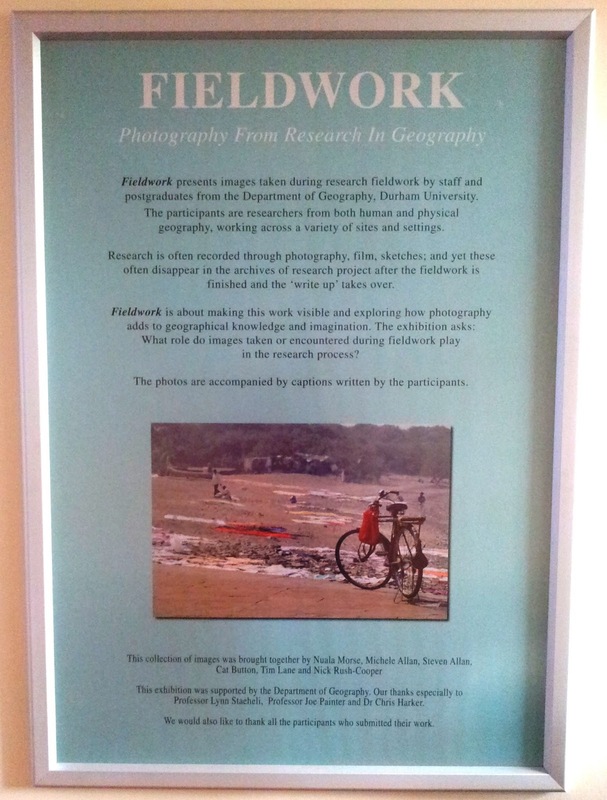 The exhibition focused on the use of photography in fieldwork. Photographs in my view are an important tool to narrate the various stories emerging in the field, especially if one is doing ethnographic work. Since, ethnography involves being, living, spending time and integrating with the community, photographs provide a very good means of recording data, information and experiences. Needless to say, if one is looking at dissemination of one's research, photographs could be one of the most effective means to do so. 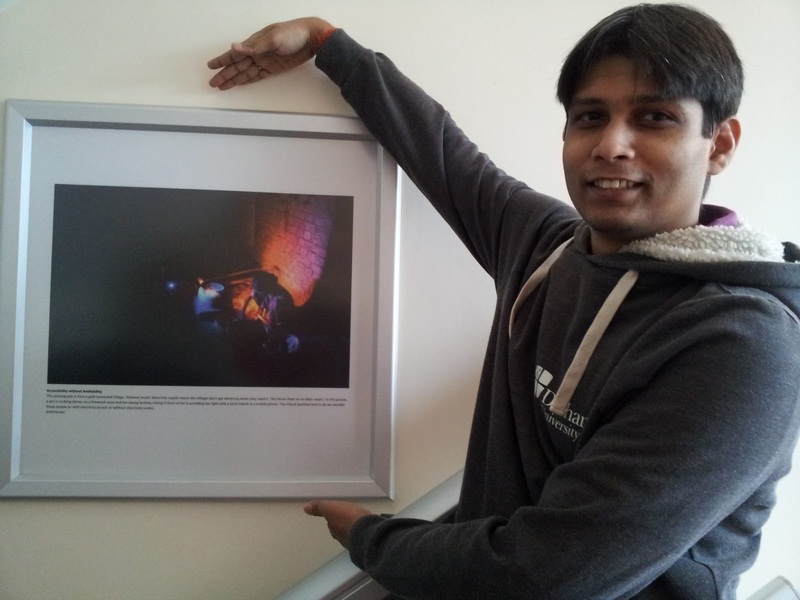 So, I submitted a few photographs out of which one was selected for the final exhibition. This is probably my favourite out of the thousands of photographs that I clicked during the 9 months in the field. There are several good ones (self appreciation) but I think this photograph takes the cake. I especially love the colours in this photograph, which came out naturally. No manipulation of the composition. I might have given a 100 different titles to this photograph (for me it tells a 100 different stories) but I would like go with the light theme. The photo is from a grid connect village. So, from the outside one would say, the village has electricity access. But as you would enter the village, a dark curtain would await you behind which are people and their lives. Does the village has electricity cables and are most of the households connected to the grid? Yes. 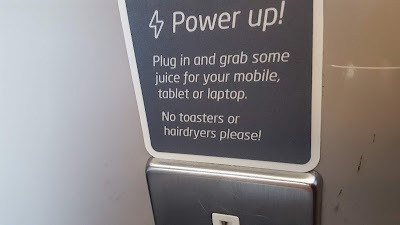 Do they get electricity supply? Mostly No. Yes, the village struggles with the highly intermittent supply of electricity. They mostly get electricity during the day, late at night or during early hours of the morning. Most people can't relay on electricity for lighting because it is simply absent when they need lighting. In this picture, a girl child can be seen cooking on a earthen stove. If you look closely, on the left, in the dark, her younger brother is sitting. What's he doing there? He is literally 'giving her light'. How? He has a mobile phone in his hand which has a torch (really just a LED) built into it. 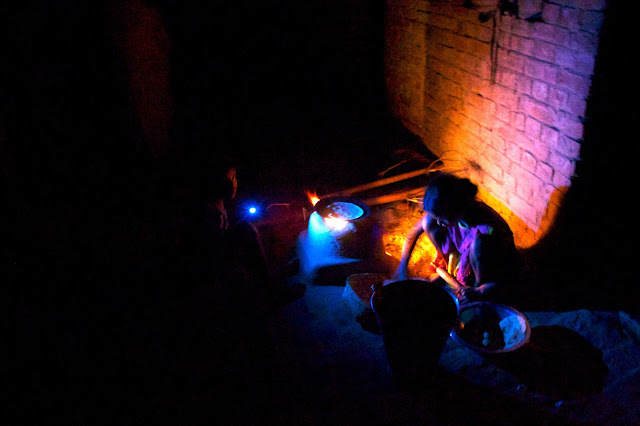 Since, there is no electricity, the boy is lighting up the stove with the mobile phone torch so his sister can seen if the chapati (bread) is cooked. If you look more closely, you might be able to see faint shapes in the dark behind the children. Two women are standing in complete darkness overseeing the cooking. We must understand that just taking the grid to someone's doorsteps ( or for that matter into someone's house) doesn't really give them access to electricity. Its the supply and several variables associated with the supply that complete the 'access' picture. This photographs surely reminds us (or at least me) that we need to revisit our definitions of 'access', 'vulnerability' and 'equity' and re align our understanding of these concepts. This picture for me also establishes up to an extent, the importance of mobile phones that people in these villages have been telling me about. It is the versatility of the mobiles, the different services that it potentially can and does provide, that makes it such and important part of people's lives. Where's the light: in the mobile phone? This post was first published on my other blog stories of lights on 11th June 2013. This reposting is a part of a plan to merge the two blogs at a later date. Truly outstanding photography.You have seen versatility of the mobile phone from such a nice angle.Really heart-touching.I have something to share with you about mobile phone.The world as a whole is rapidly adopting mobile phones,there is a baffling degree of variation in how they have been adopted in different parts of the world.One striking difference between the adoption patterns in more affluent developed countries relative to less affluent developing countries is that in the latter—particularly in rural areas—mobile phones initially are being acquired not by individuals but by households, many of which have never had a conventional landline. In many poor rural communities,mobile phones are kept in the home and are used by all members of a household, mainly for emergency calls. Only on weekends or on special occasions will a young person get permission to take the phone out of the house. In India, as in other developing countries, rural residents often regard mobile phones as valuable resources to be shared by family members and even by close friends, rather than purely personal devices. A study by LIRNEasia found that in approximately 80 percent of Indian households at the bottom of the pyramid in which one member owns a mobile phone, that phone is shared with other family members; in nearly half of these households, the phone sometimes is shared with non-family members, usually at no cost to the user.